Lays Chips mit 'Heftig Gebratenes Pepsi-Cola Huhn'-Geschmack. *Das* ist dann schon etwas ein wenig anderes, basierend auf einer Idee kreativer chinesischer Köche. As much as I like to write about healthy eating and have a fascination with pure ingredients and their proper use – most obviously, given ChiliCult’s Manifesto, when it comes to the chilli – I do have a weak spot for some kinds of junk food. Chips, in particular, are a lesson in intercultural flavor preferences, in addition to their attractiveness thanks to carbohydrates (sugar), fat and salt, (see here for a discussion of these in Chinese cooking) crunch and mouthfeel – i.e., engineered bliss. Okay, no, I actually know too much and have trained my palate a little too much not to notice their fakeness, but sometimes they are a good anti-stress measure, anyways, and I certainly like looking around at the different flavors in different places and wonder what it means. Where we now live and I come from, in Central Europe, for example, potato chips have always dominated, and they used to be predominantly plain. Salted, of course, but hardly flavored. In the last decades, however, there has been a steady trend towards more and more spicy flavors, mainly chilli-based (arguably), but also including some forays to (supposed) wasabi flavors. In Latvia, in the Baltics, on the other hand, the combination with sour cream and chives or dill – perfectly matching the idea of some dominant Eastern European “flavor principles” – is preferred. And so, we come to China. And wouldn’t that just be an odd case. It’s not even so much about truly exotic preferences as one might think. Pringles here experimented with “Street Food” flavors such as Hong Kong roast duck or Thai fish balls or something like that a while back, but there isn’t any (literal) “hot dog” flavor or anything like that. There are, however, some distinct trends. 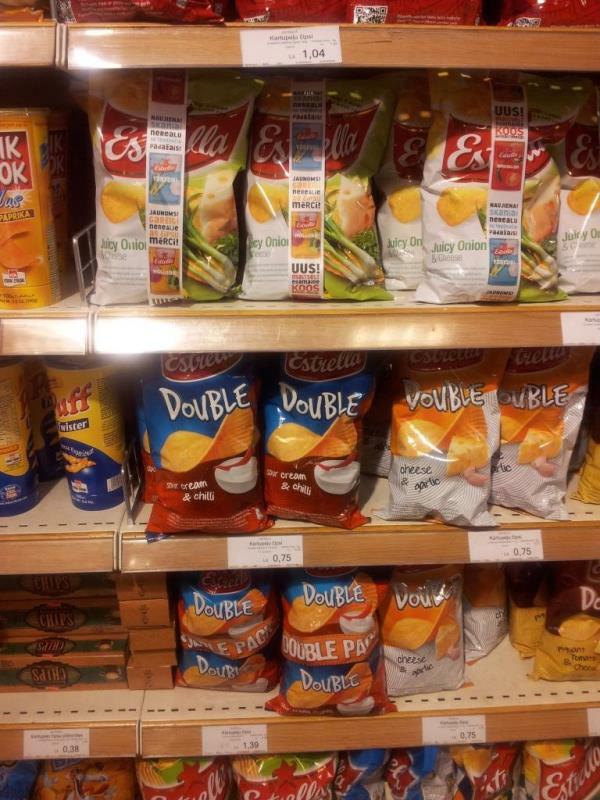 One, some chips flavors are run-of-the-mill but perhaps exhibit a certain sense of interest in exotic places. With chips themselves being snacks that are rather non-Chinese, and thus exotic to Chinese, and the exotic flavors therefore the likes of “original tomato,” “Italian red meat,” &c.
Secondly, distinctly Chinese flavors are employed, perhaps to make the whole idea more palatable. 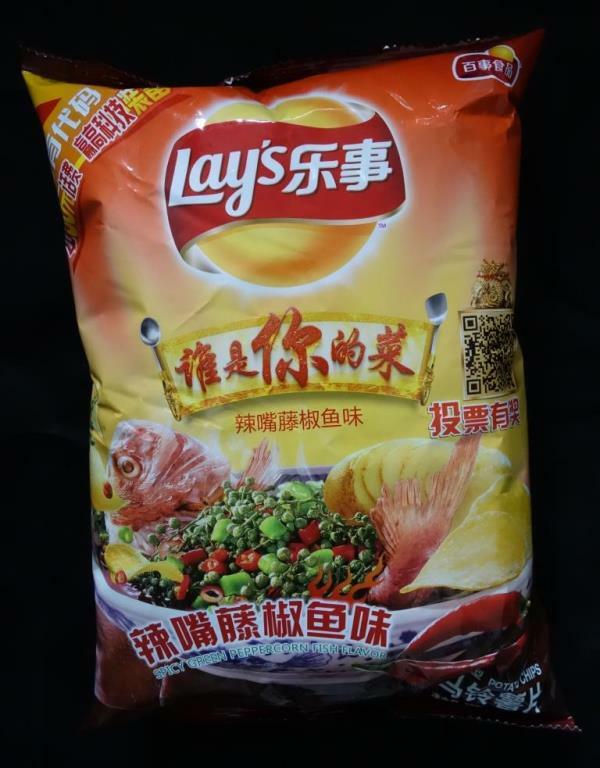 Lays, in particular, has started offering “Sichuan numb & spicy hot pot flavor” and “hot and sour fish soup flavor” chips a little while ago. 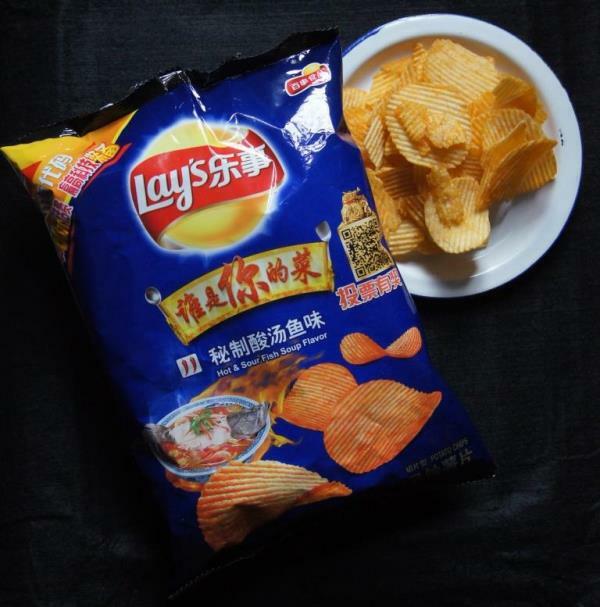 Thirdly, in catering to Chinese tastes and notions of food-as-medicine, some of the most widely available flavors of chips in China (interestingly, again by Lays) have long been those of cucumber, lemon, and blueberry. This time, I haven’t seen the latter two anymore, actually, but the idea is said to have been that the spicy and traditional flavors mentioned in 2 would be considered “winter” flavors, whereas these here are the “cooling” flavors for the summer. It’s the perfect example of how people are people, bodily (food) intelligence can be tricked and junk foods engineered for maximum effect in similar ways all around the world – and at the same time, cultural-culinary differences also make for different preferences that have to be taken into account.